TrustedHousesitters, the world’s biggest house and pet sitting business and official Cats Protection partner, has launched a new scheme dedicated to celebrating the nation’s most amazing animals. Green Pet Plaques, complete with ears, are being attached to houses up and down the country, commemorating the achievements of the amazing animal living inside. 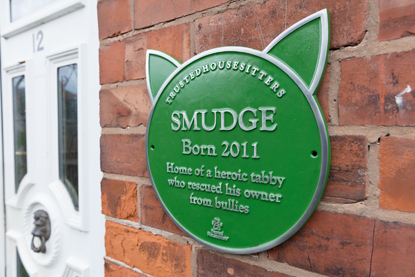 Commemorative plaques such as the English Heritage blue plaque scheme, have honoured notable men and women for over a hundred years by placing a marker on the homes they worked or lived in, but there has never been a similar scheme solely dedicated to animals. 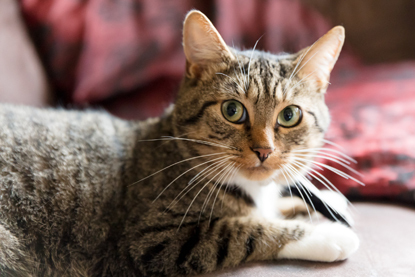 Pet owners across the country can now nominate their own pets to be honoured with a plaque, and some of the first animals to be recognised are previous winners and nominees of Cats Protection’s National Cat Awards. 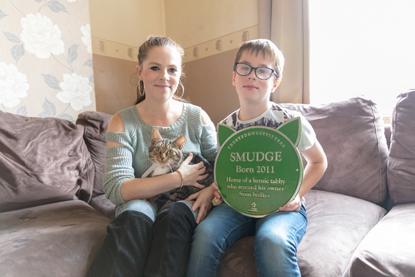 Smudge the cat was nominated for the 2014 National Cat Awards Hero Cat category after he helped protect his owner from bullies. When nine-year-old Ethan Fenton was being picked on, his heroic cat Smudge took action, pouncing on the chest of one of the bigger bullies who had pushed frightened Ethan to the ground. Shocked by Smudge’s smart move, the boy and his friends then ran away finally leaving Ethan alone. Tim Lyons, Managing Director at TrustedHousesitters said: “There are countless stories across the country of pets who have a special bond with their owners or do something incredibly heroic.